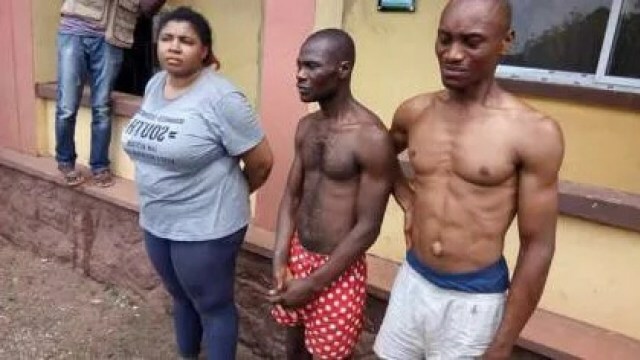 The Ogun State Police Command in Eleweran, Abeokuta, yesterday, paraded a female banker, Oluchi Tochukwu, and two suspected hired assassins over a botched plot to kill her husband, identified as Onyebuchi Tochukwu. Vanguard reporter, Daud Olatunji, reported that the couple had been married for three years and had a daughter, before the union crashed. The state Commissioner of Police, Ahmed Iliyasu, while parading the suspects at the command’s headquarters, explained that the 32-year-old banker, who is a staff of a new generation bank, allegedly masterminded the failed assassination of her estranged husband by arranging and keeping the weapons used in the attack in the husband’s compound in Ajah. The state commissioner revealed that, the two suspected assassins, 32-year-old Chigozie Smart, and 36-year-old Kingsley Ikechukwu, were intercepted at Ijebu-Ode area of Ogun State, while attempting to escape to Onitsha, Anambra State, with the would-be victim’s Range Rover. Mr Iliyasu explained that the two suspects had attacked their victim in his compound at Agungi area of Ajah in Lagos State, last Wednesday. He was allegedly attacked with iron rods and machete before the suspects poured acid on him. But he survived the attack. According to Iliyasu,”it was the smoke and the offensive odour that came out from the suit worn by the victim, when the acid touched it, that made the suspects to quickly abandon him and went away with his Range Rover SUV, which the wife instructed them to deliver to her brother in Anambra State. “The estranged couple had been separated for a while, with the wife living with her father somewhere in Ayobo area of Lagos State. “The husband had a date with a court today (yesterday) over the custody of their only daughter. Fielding questions from newsmen during their parade, Oluchi denied contracting the duo of Chigozie and Kingsley and one other, who is at large, to assassinate her estranged husband. Though she acknowledged that the three year-old marriage had crashed, Oluchi told newsmen that she had no reason to kill her husband. Meanwhile, during the interrogation, Chigozie maintained that it was Oluchi that contracted them to kill Tochukwu, with a promise of purchasing tokunbo cars for each of them after a successful operation.